I will buy a book because I like the title. When we were planning our trip, we know we have 7 days before going to Firenze. We looked at the map and I just love the name “Napoli” for no apparent reasons. Yes, let’s go to Napoli. Later, we obviously found out that Pompeii is what we cannot miss, apart from that, not really know where we will go. We read on the train and I decided one place I want to go. With that plus Pompeii will make our trip. The hotel is right next to the train station. We thought we will just take a rest today and gather some information at the train station. Unfortunately, we had this very rude and unhelpful tourist information officer. I am not sure if she is always like that or if she doesn’t like Chinese… I would like to visit the Borbonico Tunnel and I need to confirm if the 3 days pass includes the ticket I need. First, she told me that the tunnel is only open on weekends and she randomly pointed on the brochure and said it closes at 4pm and it is too late for you now. On our way back, I was looking through the brochure and found that she is wrong, the last regular tour is at 5:30pm. So, we went back and she first insisted that 5:30 is the end time. With my perseverance, she called and confirmed that the last tour starts at 5:30pm. But then, she said that the tour is in Italian only. I asked a few times whether or not they have tours in English, her face is so bad and she said “I don’t know, I didn’t ask…”. We went back to the hotel and found from the website that the tours are in both English and Italian. We asked the hotel staff to call again and confirm they will have the 5:30 tour in both languages. The most annoying thing is then I need to go back and buy the pass from this lady. Finally, we are ready to go. The good thing is, we insisted and this is the best experience so far in Italy. The Borbonico Tunnel was dig originally as escape route for the royal family, but it was never completed. Later on during WWII, it was being used as shelter for the people. The tunnel was fully abandoned by 1970s and it was only until 8 years ago that two geologies decided to clean up the tunnel and open it to public 3 days a week. In this 90 min tour, we got to know a lot more about the histories of Napoli. More importantly, the tour guide is a girl who is so passionate about this place and she fully reflects that in the guiding. She provided so much interesting information, her direct involvement makes the whole thing a lot more personal and not just book reading. We highly recommend this tour and I hope all the other tour guides can be the same as Lucia, and brings joy to visitors. 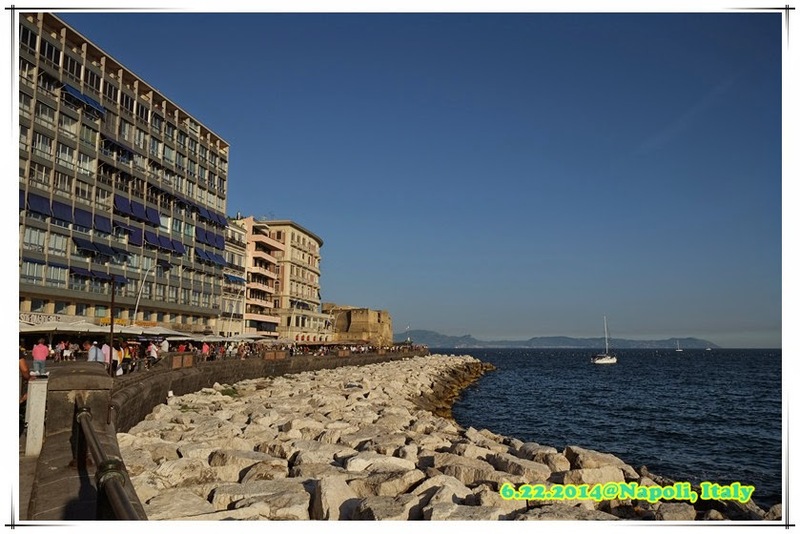 Apart from that, Napoli is also a very comfortable city to walk around, and you can walk by the seaside also. 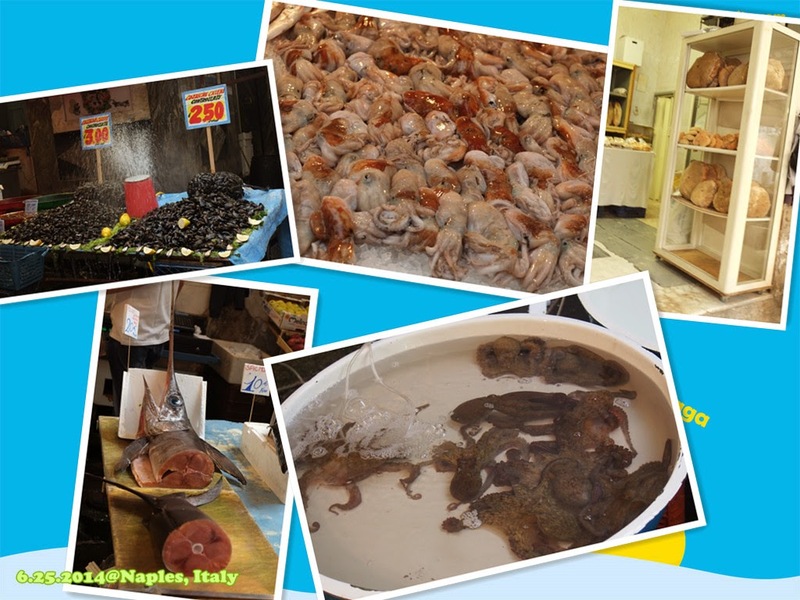 There is a wet market near our hotel and there are lots of seafood, including live octopus, although very expensive. 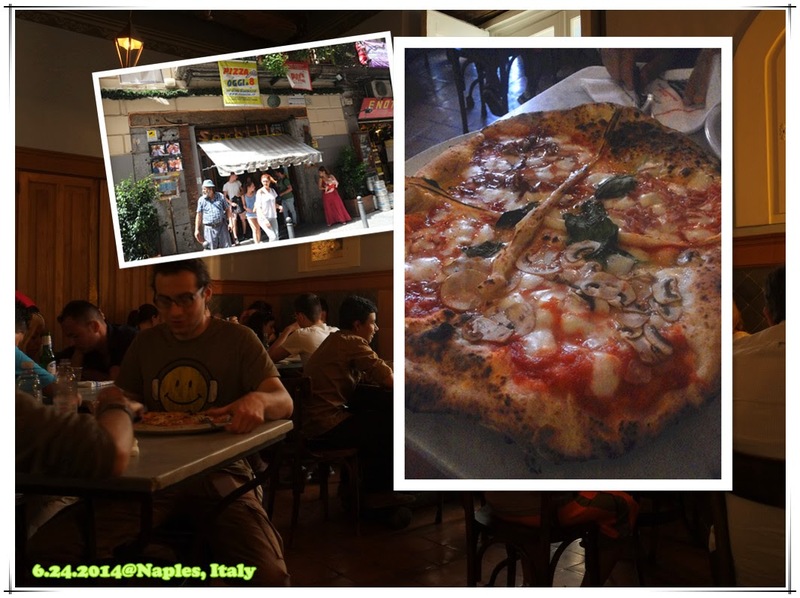 Furthermore, Italian pizza originated from Napoli. We tasted it at a local pizzeria, long queue! !